Atlanta's extremely heavy traffic congestion just got worse. A massive fire along I-85 in the city caused a portion of a bridge to collapse Thursday night, walling off a major transportation artery in and out of the city. Initially, the collapse affected the northbound lanes of the heavily-traveled thoroughfare. On Friday, Georgia Department of Transportation Commissioner Russell McMurry announced the southbound sections received enough damage from the intense fire that that section will have to be replaced as well. McMurry said the fire started in an area that is part of the state's right-of-way, where construction equipment and supplies were stored. How it all happened remains a mystery at this point. “We are as eager to learn the cause of this fire as anyone, which is why we will continue to work closely and in full cooperation with fire investigators to determine exactly how the fire was started,” McMurry said. For the foreseeable future, Georgia officials says I-85 will be closed from the I-75/Brookwood split to the North Druid Hills Exit. Motorists are urged to avoid that area. Motorists traveling northbound on I-85 from south of Atlanta will take a detour to northbound I-75 at Brookwood near 17th Street. Those going south on I-85 north of Atlanta will be diverted to northbound on SR400. 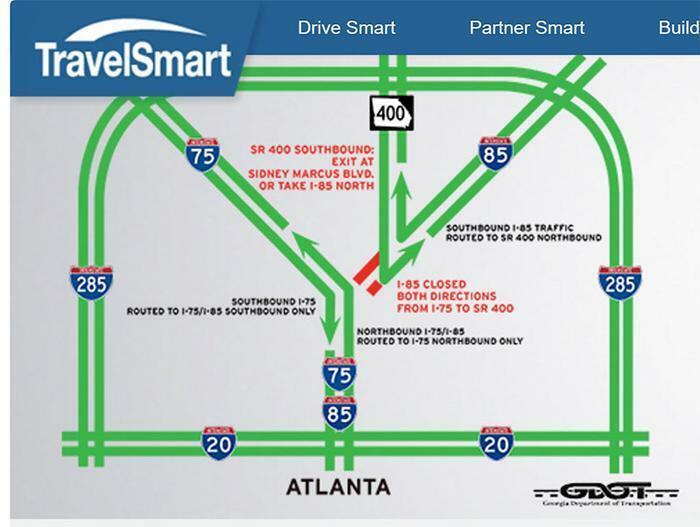 Those going south of SR400 from north of Atlanta will be diverted at the Sidney Marcus exit. The bridge collapse comes just as Washington is preparing to address new infrastructure spending. Though it is too early to tell whether the bridge collapse was related to anything other than an intense fire, President Trump and some Congressional Democrats have argued the government should allocate more federal spending to address the country's aging roads and bridges.